Hearing protection you've been looking for. 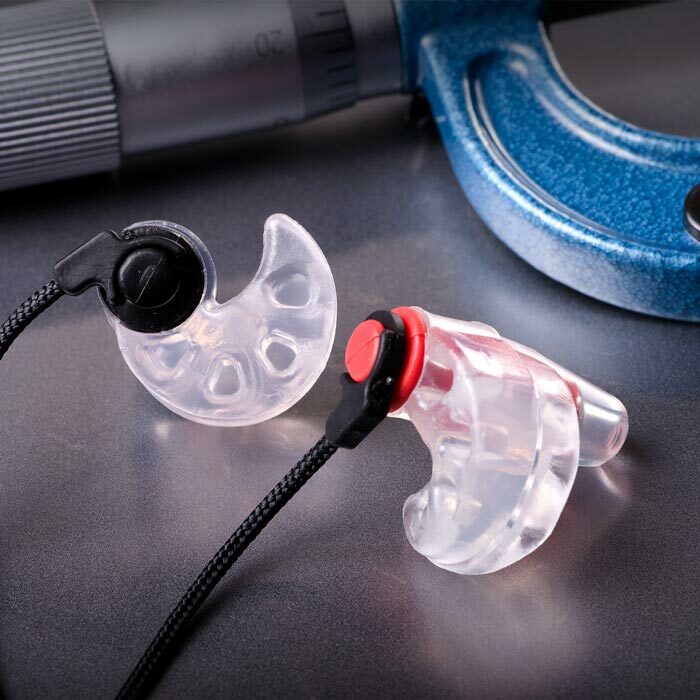 "Custom Fit hearing protection is the best way to protect your ears." “YOU CAN CARRY” highlights Flugz that “fit great” in their newest product review. Use the Flugz canister for warming and forming and hold on to it for storge and travel.. The package includes right and left Flugz, lanyard and instructions. FORMING INSTRUCTIONS: RED post is for right ear, BLACK post is for left. ATTENTION: Recommended for ages 12 and up. 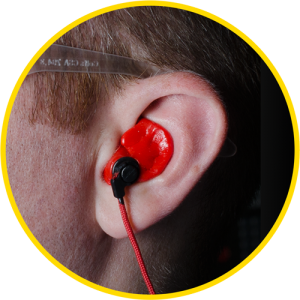 Form earplugs to your own ear, do not attempt to insert and form earplugs on another person’s ear. 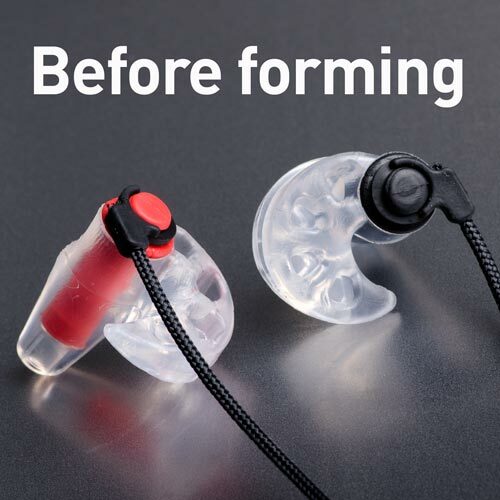 PRO TIP: If this is your first time forming a pair of FLUGZ earplugs, we recommend forming one earplug at a time so the second one does not cool while you form the first earplug. To download a printable pdf of FLUGZ User Guide, Click Here. Peel open, remove and throw away metal lid. 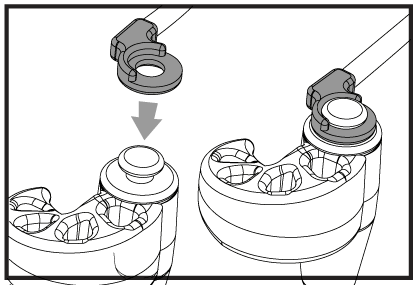 Secure one FLUGZ earplug by inserting the lanyard post into the holder on the bottom of the cup. This will ensure it is heated evenly in the microwave. NOTE: The metal rim on the cup is microwave safe. 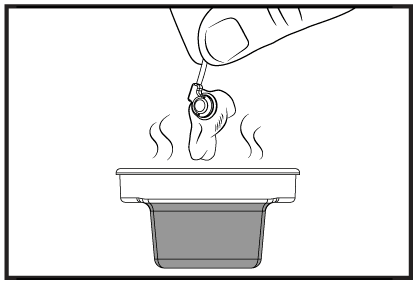 With only one earplug inserted in the microwave safe cup, fill the cup up to the ledge with room temperature water. Microwave uncovered on HIGH for 30 seconds. CAUTION: DO NOT microwave the earplugs by themselves without water. Pour the hot water out of the cup. The earplug will be wet and slightly tacky. Carefully remove the earplug and hold it by the lanyard post. Blow off the excess water before inserting into ear. 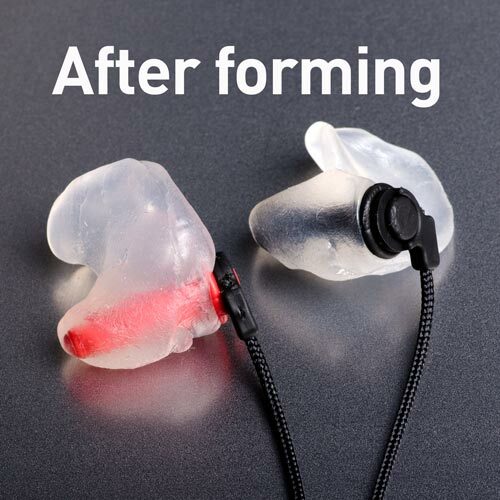 NOTE: The FLUGZ earplug material will slightly deform and lose some of its original shape when heated. This is normal. To insert the FLUGZ earplug, reach over your head and pull up on your RIGHT ear with your LEFT hand. Open your jaw. While holding the RIGHT (RED) earplug by the lanyard post with your RIGHT hand, insert the earplug into your ear canal. Press on the lanyard post to help guide the earplug into your ear canal. 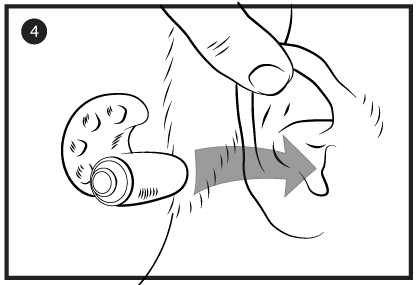 Once the earplug is in your ear canal, let go of your RIGHT ear and close your jaw and IMMEDIATELY move to STEP 5. 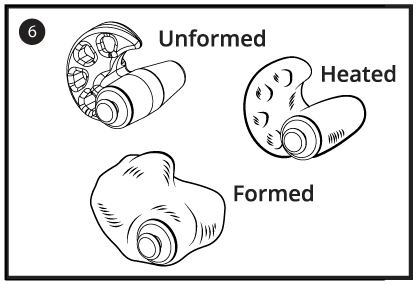 Note: Illustration shows the RIGHT ear. 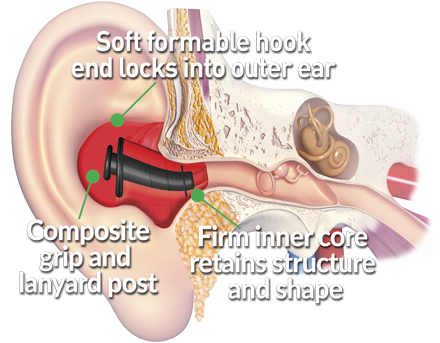 Orient the FLUGZ earplug as shown, with the curved portion oriented UP. 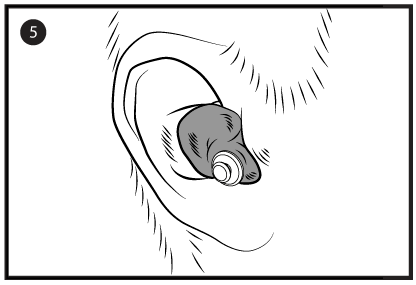 Once the earplug is inserted into your ear canal, continue to press and mold to your ear lobe as shown. 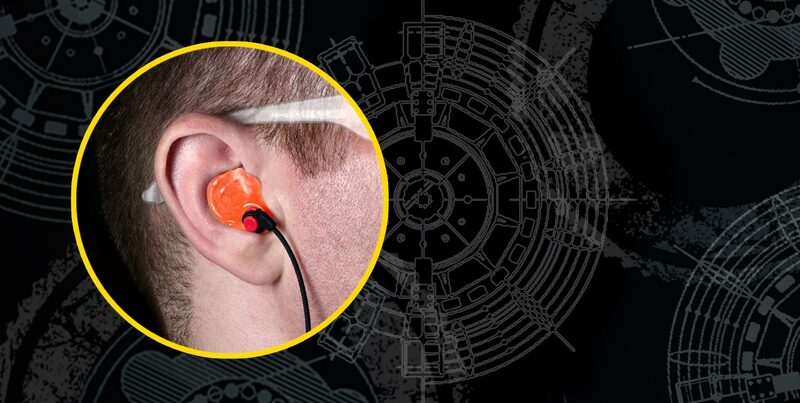 Once you feel the earplug is formed, hold in place for 30 seconds. Let the earplug cool in your ear for an additional 90 seconds. 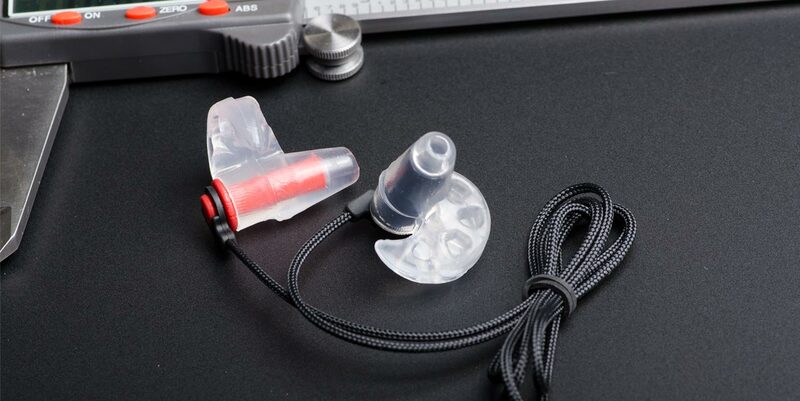 Note: The molded ear plug will take on the shape of your ear and will no longer have the original shape or appearance. 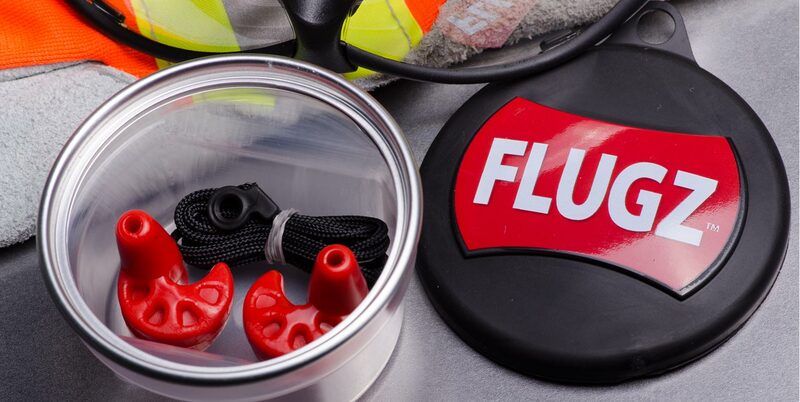 Remove the FLUGZ earplug from your ear and let cool for an additional 5 minutes before placing back into your ear. 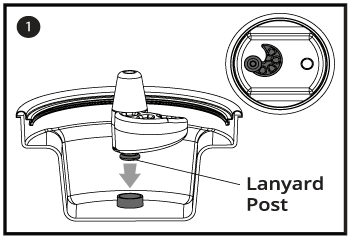 Continue STEP 1–6 for the opposite earplug. NOTE: If you can still see the original indentions from the unformed earplug, it may not have been formed well enough to your ear. Move on to the re-heating instructions if you feel you need to try forming the earplug again. Press the lanyard loop directly down onto the lanyard post of the FLUGZ earplug, twisting back and forth slightly. 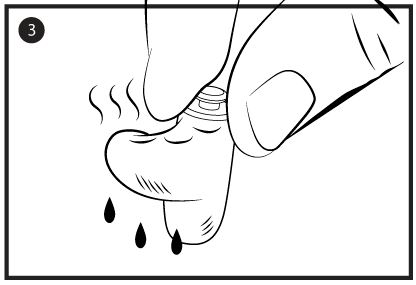 CLEANING INSTRUCTIONS: Your FLUGZ earplugs may become soiled with regular use. This will prevent the earplugs from creating a perfect seal in the ear. Simply use a mild soap and lukewarm water to clean soiled or dirty earplugs. Lightly pat dry with a cloth. If you are no longer getting a perfect t, you can re-heat and re-form the earplugs as often as necessary. 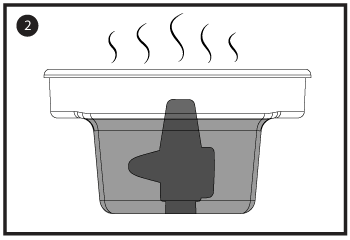 Fill the microwave safe cup up to the ledge with water and microwave uncovered for 30 seconds WITHOUT the earplugs in the cup. Using the lanyard, dip an earplug into the hot water for 10–15 seconds. This will heat and soften the outer material enough to reform to your ear. You may need to mold the material slightly if it has been pressed away from the core. Blow off the excess water and reform to your ear. Flugz are designed to soften and conform to the unique shape of your ear. They will hold their shape when firm and easily slip in and out of your ear.